The APC laboratory is happy to welcome Darren Grant (University of Alberta) on Thursday and Friday later this week. 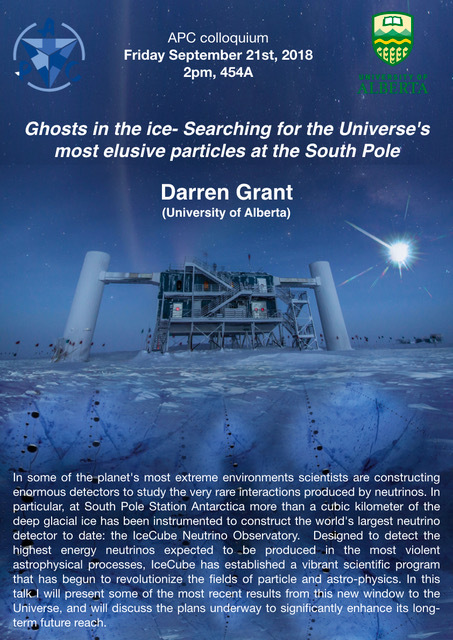 Darren kindly accepted to give a colloquium entitled “Ghosts in the ice — Searching for the Universe’s most elusive particles at the South Pole” (abstract and poster below), in 454A at 2pm on Friday, Sep 21. Abstract: In some of the planet’s most extreme environments scientists are constructing enormous detectors to study the very rare interactions produced by neutrinos. In particular, at South Pole Station Antarctica more than a cubic kilometer of the deep glacial ice has been instrumented to construct the world’s largest neutrino detector to date: the IceCube Neutrino Observatory. Designed to detect the highest energy neutrinos expected to be produced inthe most violent astrophysical processes, IceCube has established a vibrant scientific program that has begun to revolutionize the fields of particle and astro-physics.In this talk I will present some of the most recent results from this new window to the Universe, and will discuss the plans underway to significantly enhance its long-term future reach.